Eder first earned her bachelor’s degree in English in 1975, and continuing her education at Edinboro University, received a master’s degree in English Literature in 1976; along with an honorary doctorate of Humane Letters in 2013. Eder went on to enlist in the U.S. Army, and served in the army for 36 years, retiring in 2013 with the title of Army Major General, the highest permanent peacetime rank possible. Eder began the lecture confessing that, like most college graduates, she had no idea what she was going to do with her degree. After considering becoming an English teacher and several other English-centered careers, Eder decided to enlist in the U.S. Army. “The military has been a vehicle for me,” she said. Eder also expressed that the military opened up a world of opportunities for her and that she originally joined the military for the public relations unit. Additionally, throughout the “Life in the Liberal Arts: Adventures of a Wayward English Major” presentation, Eder shared how her extensive education in the liberal arts impacted her life, and how a strong background in that subject can lead to a variety of opportunities in nearly any major. Eder also stressed that a strong background in liberal arts gives an individual the basis for essential leadership qualities that can be vital in everyday life; qualities she found essential during her time in the military. These leadership qualities included adapting, empathy, analyzing and strategizing. Personally, Eder has first-hand experience with adapting to new situations; the military and living in a different country being her prime examples. Eder shared she lived in Germany for five years and struggled to adjust to the country’s culture and lifestyle. However, she also expressed that “if you can’t adapt, you can’t learn,” and she therefore pushed herself to adapt to the German culture for the sake of learning. As for the other characteristics, Eder expressed the importance of empathy in terms of human interaction, and expressed the compassion one shows in a particular situation can affect another’s perspective of said individual. Additionally, for analyzing and strategizing, Eder noted the two go hand-in-hand, and that the ability to analyze leads and the ability to strategize ultimately, helps one move forward. Eder stressed the importance of these characteristics, due to their relativity to liberal arts, and the immense impact they have had on her life. “I think I have been blessed to have a number of experiences,” she said. Eder also stressed the immense impact literature can have on one’s life and that education in the liberal arts will always be a necessity. She explained how she is extremely proud to be an Edinboro University alumni and enjoys sharing her experiences with current students. “I love to come back here.” The accomplished alumni also remarked that Edinboro University has helped her not only make a living, but also a life. Eder parted with encouraging words and challenged the audience to pursue a career that will not only make a living, but also a life. 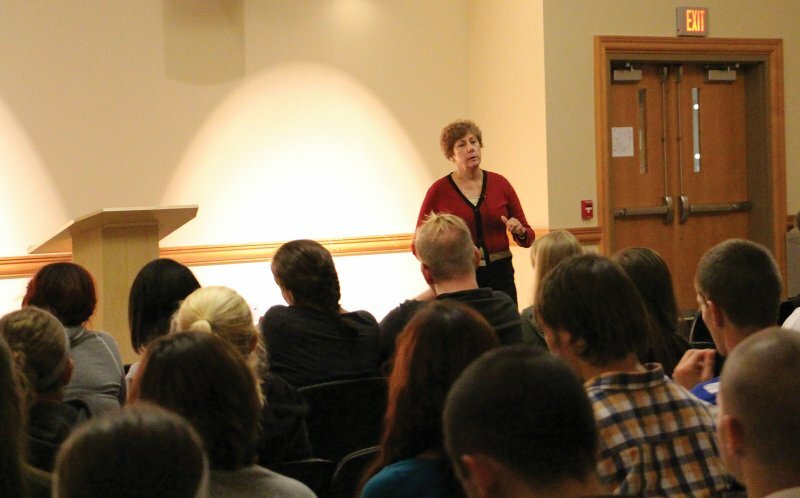 For more information regarding Eder’s lecture and life experiences, visit edinboro.edu and search “Distinguished Alumni Lecture Series.” Also, stay informed on the series by visiting the campus media website, edinboronow.com.